Recently I noticed that my ETA 2824-2 movement was difficult to wind. After a couple revolutions I realized what was happening. When winding via the crown, it's actually spinning the rotor as well. Anyone come across this? The watch is less than a year old and under warranty, so I have the option to send it in for repair if necessary. That's a symptom of malfunctioning reversing wheels (quite common, but usually on older watches that are closer to their service limit where the reversing wheels are gummed up). Usually cleaning and lubrication will solve the problem (unless damaged and in need of replacement). Stop manually winding it immediately and send it in for warranty service. Here's an explanation by (and with credit to) Al of Archer Watches. The red arrow points to a series of pawls inside the wheel, which is actually two wheels in one. When spun in one direction, the two halves of the wheel lock and spin as one. When spun in the other direction, one half spins and the other does not. This ability allows you to manually wind your watch, without having the rotor spin inside the case when you wind using the crown. 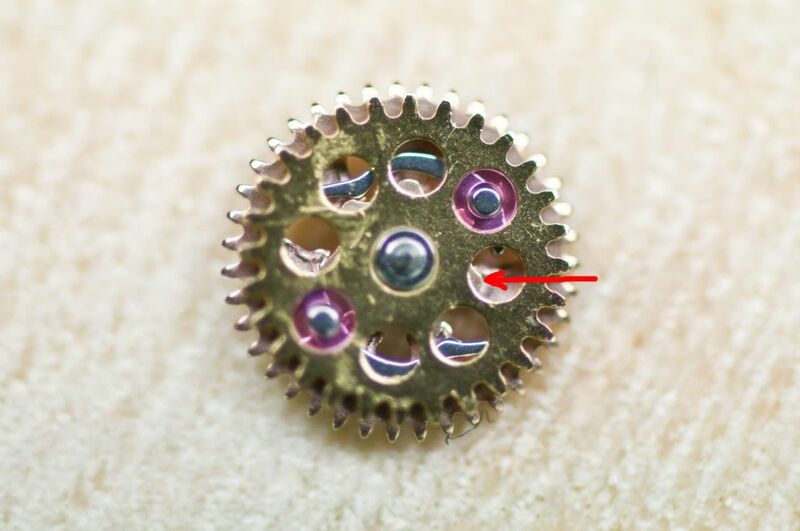 This wheel is the weak spot in an automatic winding watch. Actually that's not fair - in reality these wheels work as hard as anything inside your watch. They are under a lot of load from both manual winding and when the rotor is winding the watch. They change directions an estimated 1 to 10 million times a year according to one text I have. So indeed it is amazing that they last for a full 5 years between servicing - that's between 5 and 50 million direction changes. So what happens when these reversing wheels fail? Well you may notice that when you wind the crown, you can feel the rotor flying around as you wind. If you feel this, stop, and get the watch in for service. The wheels are no longer spinning freely in one direction, and you risk damage to those fine teeth on the ratchet wheel when you wind with the rotor spinning like that. Those fine teeth are now driving that big heavy rotor around and around, and they usually can't take that sort of punishment for long before the teeth get stripped off. So to conclude, in a properly functioning, well maintained, and good quality automatic watch, there is little risk in winding it manually. Hope this helps. As always if you have any questions, please let me know. Last edited by BrentYYC; September 3rd, 2015 at 02:52. AzHadEnuf, ffritz, rdoder and 3 others like this. Great info, thanks BrentYYC (and Al). I seem to recall reading more than a few times that the ETA 2824 has relatively fragile keyless works and issues from hand winding too often are not totally uncommon. I have one watch with an ETA 2824 and I try to avoid hand winding it whenever possible. Probably sound advice. In my searching I saw several that had issues when manually winding the 2824. I tend to rotate between about 4 watches so out of habit, when I'd grab that one, I'd give it a good winding. I'll definitely avoid that in the future with this movement. Before I rant, let me ask this: is it common for automatics to have weaker hand winding systems? For a company with the size and influence of ETA to continue producing a common movement with a basic problem like this is b*llsh!t. Sorry. Maybe I could have mine modded to remove the hand winding mechanism just like I removed the broken air conditioner from my last car. I'm not going to comment on this topic, there are a few here that think you can crank away on a 2824 and have no issues whatsoever and will aggressively stand behind that in spite of what the professionals say, you know who you are. Obviously you know where I stand on this ongoing issue. I have the same issue with my ETA, and noticed it very soon after buying the watch brand new. It seems to be a very common problem with some ETA models, so I am not going to bother having it fixed as I suspect it will just fail again. It it serves me well as a occasional camping watch because I wear it several days in a row, otherwise my solution is to just not buy anymore ETA 28XX watches. Eta 2824 issue. Winding stem?